Is your dog big or small? It's a pretty common question, yet difficult to answer. It depends on what you're used to, and it is impossible to give a straight answer without a common point of reference. It's hard enough to buy dog chews or a harness for walking and get the right size. When investing in a high quality dog door, the size needs to be right. To make it more complicated, the right size pet door usually looks small compared to the pet. We tend to compare to humans going through human doors, but a dog will duck its head and lift its feet when going or running through, and the opening doesn't have to be as tall as the dog is. 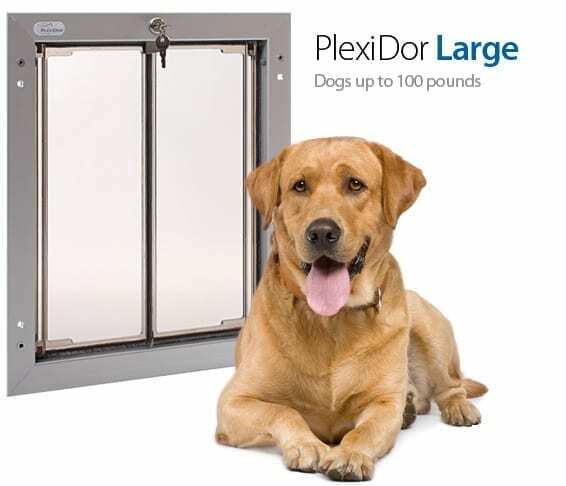 Here are some guidelines to finding the right size PlexiDor dog door. If you have bigger and smaller pets together, the smaller pets can usually open a bigger door - the panels swing easily - but you might have to adjust the installation height so they can both get through. If you have any questions or your dog is just on the edge of the weight recommendation, call customer service at 800-749-9609. The PlexiDor size small has an opening of 6.5 x 7 1/4 inches. 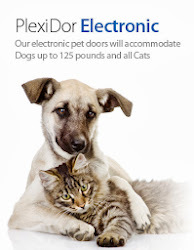 This door is perfect for dogs up to nine pounds and for cats up to 24 pounds. 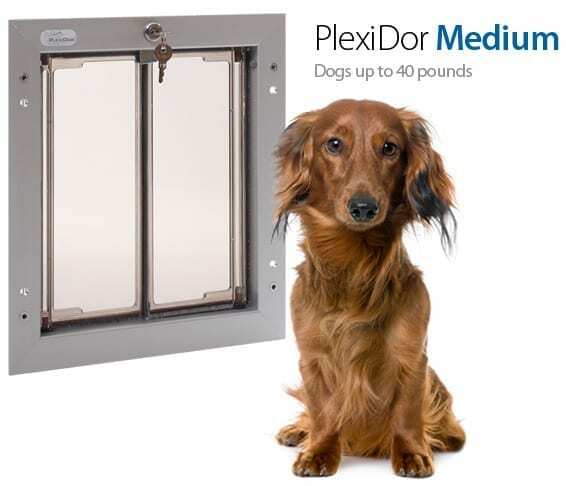 The medium PlexiDor dog door is great for dogs up to 40 pounds. The opening in 9 x 12 inches. Remember, the door doesn't have to be as tall as the pet, but it definitely has to be wide enough for the pet to get through. 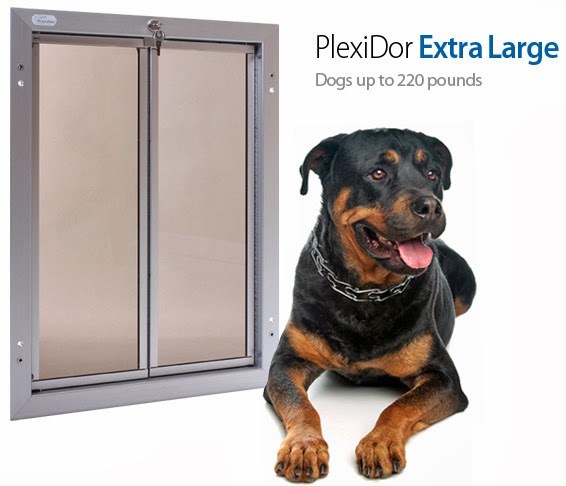 A large PlexiDor dog door is perfect for dogs up to 100 pounds. The opening is 11 3/4 x 16 inches. Common breeds using this door includes Labradors, Golden Retrievers, German Shepherds, Collies, and Dobermans. 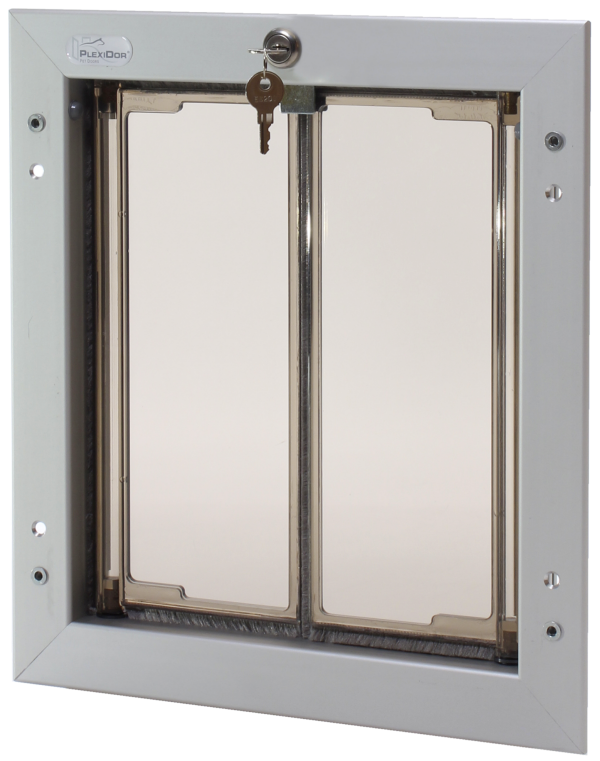 The extra large PlexiDor dog door is constructed to handle the impact of very large doors hitting it at a full run. It is intended for dogs up to 220 pounds, and the opening is 16 x 23 3/4 inches. 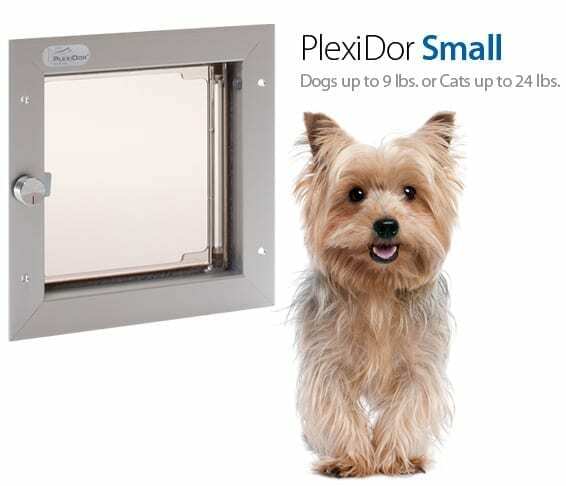 For more information, download the PlexiDor size chart with dog breed examples and suggested installation heights, and the information chart with opening sizes and needed cut holes for door and wall installations. You can naturally also contact customer service - the PlexiDor customer service representatives have extensive experience and would love to help.